Franke Monje – Water Skier Extraordinaire! 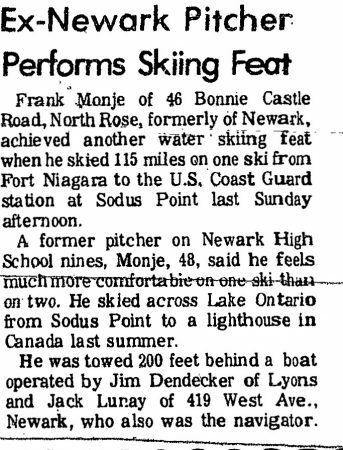 Frank Monje liked to waterski! He liked it a lot! Frank and his family had a cottage on Emerald Point in the 1960s and 70s and later another cottage near Bonnie Castle. Relatives told me that during summer nights you could count on Frank waterskiing on Sodus Bay almost every night weather permitting. He would start on two skis and then go to single slalom skiing. He would then change to water skiing backward all the while chewing on a toothpick and smiling the entire time. Another thing that you could count on with Frank was always having a black lab as a side kick. He had many of them over the years. He would spend those nights on the Bay when he could not ski tossing stones into the water which his black lab “Smokey” would retrieve for hours on end. A later black lab named “Surf” would waterski with him! Frank’s family migrated from Holland in 1912 and settled in the Newark area. Outside of waterskiing, Frank was an outstanding and well known mason who among other things did cobblestone restoration which takes both a great deal of skill and patience. Frank was a humble man but he liked challenges. He always liked to push the envelope especially when it came to waterskiing. This is why in 1977 he decided to waterski from Sodus Point to Canada and back only telling a few friends he was going to do it. After nearly 4 hours, Frank returned exhausted and triumph. Frank Monje and friends the morning he crossed the lake. Photo courtesy of Vicki Bolleman Fischer. So what’s a fella who likes challenges to do, for an encore after this? 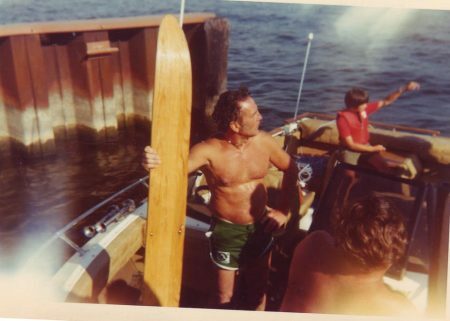 The following year on September 2, 1978, Frank waterskied (again on one ski) 115 miles from Fort Niagara, Canada to the Sodus Point Coast Guard Station in 4 hours and 18 minutes. At the end of the trip he was so exhausted he had to be carried to the dock, but he did it! 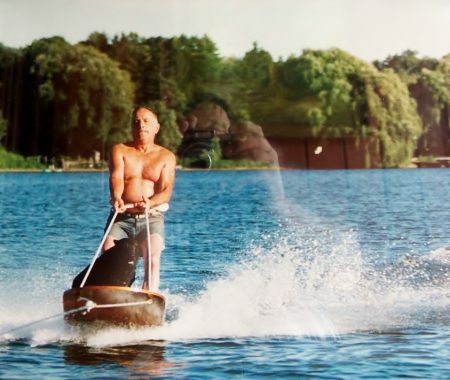 Sadly, Frank Monje has now passed away but if they have waterskiing in Heaven, you know where you can find him.